A few weeks ago I presented my finished coat: Vogue 8548. Some of you lovely readers requested to see the inside. Well here it is, better late than never, right? I'm getting married in September and gathering things for our future home. 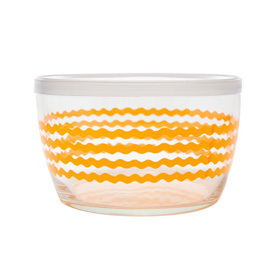 I've been searching for some casual dinnerware, that I like for a while now. It's been hard to find something that wasn't just plain white, or there is a trend to have birds or bugs on dinnerware (has anyone else noticed this? ), which I'm not really into. 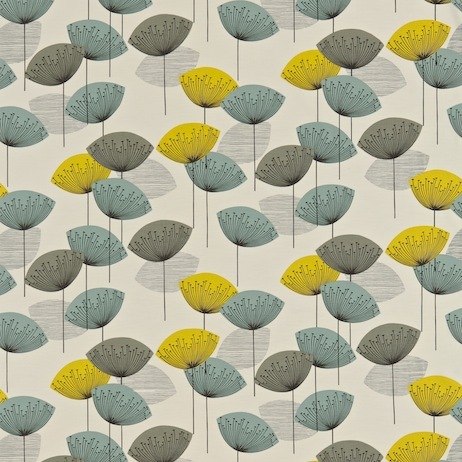 But then I discovered that the English fabric brand Sanderson, produced dinnerware based on their fabric designs. What could be better? 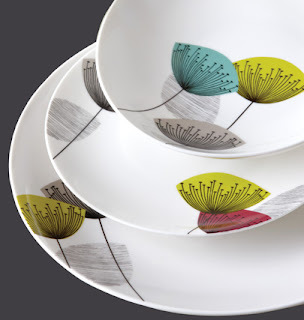 Of course I found out that my beloved dinnerware is only available in the UK, and then discovered it is being discontinued. I searched the internet and bought the last of it at Havens, they were great, and I got 30% off. As you can see, I was very excited to get it. After I finished the Roobios dress for the second time, I still had a bit of fabric left over, and whipped up some meringue! Meringue is the first pattern in the Colette Sewing Handbook : a must have for anyone that wants to sew. I had enough of the wool herringbone for the skirt body and the waist facing, but not the hem facing. I used a little bit of grey poly that was laying around. I finally gave in and bought an invisible zipper foot, and was amazed that my zipper looked actually invisible. Imagine that! I also love the way that the waist facing is enclosed on the zipper side. It makes it look so much more professional. This skirt came together in a flash and really is a useful wardrobe addition. I can wear it with about a million things. I'm definitely going to make more, that I can wear in the spring. P.S. does anyone know why there is the weird shadow in the pictures and what I can do about it? I'm new at using my fancy camera. About a year ago, I tackled my first "real" dress, the Roobios by Colette patterns. It came out OK, I think it was a little big, and I hardly wore it. Since then, I have lost some weight and decided to alter Roobios. It had to be taken in everywhere, so I removed the bodice from the skirt, and took the bodice apart. I had extra fabric to cut the bodice (pieces a & b) again, and reused the other pieces. I used a wool herringbone grey wool and a puce colored silk charmeuse for the facings, pockets, and the piping. The charmeuse was not as delicate as I thought, and was still usable. I remade the top 2 sizes smaller, and then took in the seams of the skirt accordingly. As you can see below the back was really gaping, and I'm glad it fits much better now. It's really amazing how much I've learned about sewing in such a short time. The dress came together in a pinch, the piping was so much easier to do, and it is much more wearable. What do you think? Have you ever remade a project? Or looked at your work in the past? 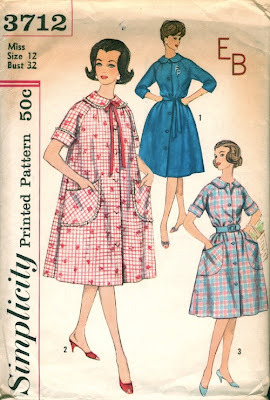 I needed something warm and cozy for hanging around the house, and this vintage Simplicity pattern fit the bill. 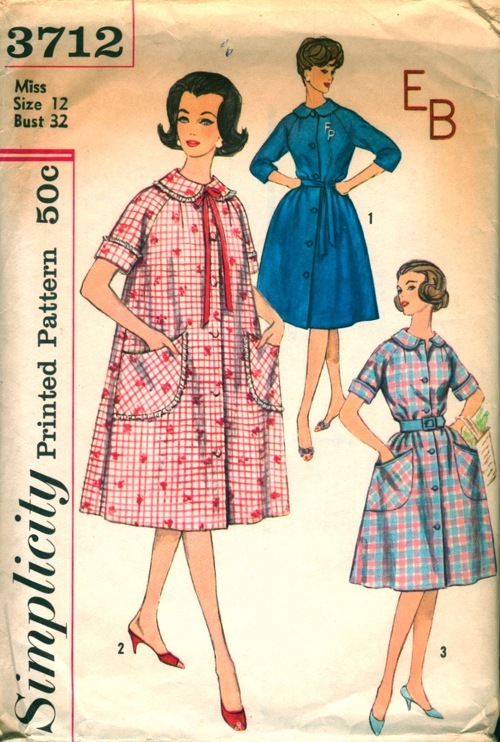 Simplicity 3712 from 1961, is a raglan sleeve robe, with a small collar and front button closing. I used a red sweatshirt material, which made for really easy sewing. The pattern included darts on the upper sleeves as well as the neckline, creating a tailored look. It is rather glamorous for something not intended to leave the house. I made version one complete with the embroidered monogram, done in satin stitch. I only made some slight changes to the overall pattern. I added some belt loops to keep the sash in place, added a cell phone sized pocket and hemmed quite a few inches off. I thought the buttons might be uncomfortable while lounging, but I don't even notice them. I like this robe even more than a conventional wrap style robe because everything stays in place. The collar and buttons give off a neat appearance while I'm acting slovenly. Of course lounging would not be complete without my beloved bunny slippers.